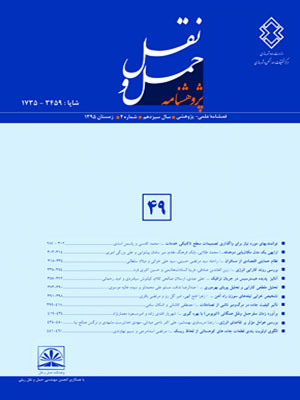 مرتضی مرندی, سید, صفاپور, پروین. (1385). تثبیت لایه اساس با استفاده از تکنولوژی نوین سیمان و امولسیون (مطالعه موردی احداث راه اصلی دوغارون- هرات افغانستان). پژوهشنامه حمل و نقل, 3(2), -. سید مرتضی مرندی; پروین صفاپور. "تثبیت لایه اساس با استفاده از تکنولوژی نوین سیمان و امولسیون (مطالعه موردی احداث راه اصلی دوغارون- هرات افغانستان)". پژوهشنامه حمل و نقل, 3, 2, 1385, -. مرتضی مرندی, سید, صفاپور, پروین. (1385). 'تثبیت لایه اساس با استفاده از تکنولوژی نوین سیمان و امولسیون (مطالعه موردی احداث راه اصلی دوغارون- هرات افغانستان)', پژوهشنامه حمل و نقل, 3(2), pp. -. مرتضی مرندی, سید, صفاپور, پروین. تثبیت لایه اساس با استفاده از تکنولوژی نوین سیمان و امولسیون (مطالعه موردی احداث راه اصلی دوغارون- هرات افغانستان). پژوهشنامه حمل و نقل, 1385; 3(2): -. پروژه راه اصلی دوغارون- هرات به طول 122 کیلومتر به عنوان بخشی از کمک های نظام جمهوری اسلامی ایران به افغانستان اجرا گردیده است. با توجه به وضعیت خاص منطقه، کمبود مصالح مرغوب و بارگیری بیش از حد کامیونهای افغانی (حدود 70 تن در هر تریلر)، این جاده به صورت ویژه طراحی شده و به مرحله اجرا درآمد. در روسازی جاده مزبور از روش پیشرفته تثبیت لایه اساس با استفاده از سیمان و قیر امولسیون و همچنین ماشین‌آلات ویژه بهره‌گیری شده است. در طراحی این جاده از روش شل و نرم افزارهای PAVERS و PADS استفاده شده است. استفاده از ماشین آلات مخصوص جهت اجرای این جاده و بکارگیری از فناوری نوین تثبیت و کنترل کیفیت با دستگاه خیز سنج دینامیکی1 نشان می دهد که ظرفیت باربری لایه تثبیت شده بیش از دو برابر روشهای سنتی بوده و افزون بر این سرعت اجرای عملیات به گونه ای محسوس هزینه های اجرایی را کاهش داده است. 2Lecturer, Department of Computer Engineering, Shahid Bahonar University of Kerman, Kerman, Iran. Heart - Dogharoon main road project with 122 kilometers in length was constructed with international donation as a part of support to Afghanistan. Due to special condition in this area, lack of good quality material and over loading passing trucks (70 tons per trailer), this road was designed and executed with special consideration. For design of this road, stabilization method using emulsion bitumen and cement with related special equipments was used. PAVERS and PADS software programs were used to design the thickness of the layers. The quality of stabilized base layer was controlled by Falling Weight Deflectometer (FWD). The results showed that the bearing capacity of stabilized layer was more than twice amount of predicted figure.Also the execution time period was decreased considerably in compare with conventional method.To construct roads and runways with high bearing capacity and to increase the roads life time and bearing capacity for heavier loads, various methods are introduced. Methods such as improvement of pavement materials, increasing the layers thickness, renovation with soil stabilization and Cold Mix Recycling (CMR) using lime, cement, bitumen and etc. are used .Stabilization of materials using emulsion bitumen and cement is a method which introduces a proper way for aggregates improvement. The experiences show that, using emulsion bitumen has successfully increases the bearing capacity of roads and runways.Emulsion bitumen as a stabilizer material is used predominantly in recent years and due to its various benefits such as high bearing strength, environmental and economical goals and ease of use is admired by experts. Furthermore, using emulsion bitumen in cold recycling process has specific acceptability and popularity between the users .Emulsion bitumen with exclusive properties can be used in various quality aggregates and also soil materials with high plasticity index. Besides, one of the most uses of emulsion bitumen is in cold recycling process. High speed in performance, easy to work with emulsion bitumen producing plant, easy and quick compaction of produced layers, possibility of using traffic on the constructed layer immediately after construction, and economic and environmental advantages are attractive factors encouraging road builders and contractors touse emulsion bitumen.In this paper and in a study case, while the method of stabilization using emulsion bitumen and cement is introduced, design method, execution procedures and quality control of 122 kilometers main international transit road constructed in Afghanistan is presented and compared with conventional method from economical points of view. The benefits of this method, mix design procedures and related laboratory tests and pavement design are studied and analyzed precisely. The results show that, not only the bearing capacity is increased in comparison with conventional methods but, the execution period and consequently the costs are decreased considerably.At each stage of stabilization, various laboratory tests such as unconfined compression strength test, indirect tensile strength test, in situ and laboratory densities, moisture content and cement and bitumen emulsion contents were carried out. All tests showed that the results are acceptable and in cases, the results of bearing capacity were more than twice as much that was predicted.To determine the modulus of elasticity and to control the quality of the sections performed, a falling weight deflectometer machine was used. The measuring points were every 50 meters in both traffic lines. Back calculated modulus of elasticity of the sections 0 to 23, 23 to 32.3 and 35.3 to 44.4 kilometers of the Heart - Dogharoon main road were determined. The results showed that the average measured modulus of elasticity is more than twice the figure predicted( the predicted figure in design was 1500 N/mm2). It means, the bearing capacity of the sections performed, reached to an excellent result and satisfied the high limit of loading in that area.